With Christmas just a distant memory and Spring still a fair way off (despite the bizarrely unseasonal arrival of daffodil or two), it feels like comfort food should be firmly on the foodie agenda. I was therefore excited to discover that over the coming weeks The Guardian will be giving away a series of 36 collectable recipe cards tackling this very subject. With contributions from seven stellar chefs including Yottam Ottolenghi, Angela Hartnett and Hugh Fearnley-Whittingstall, the recipes on offer look set to be a little more exciting than your standard soups and stews, promising to inject some serious flavour into the dark, cold evenings ahead. In this article last week, Hugh Fearnley-Whittingstall argued against the idea that comfort food is intrinsically heavy, stodgy or carb-laden, suggesting that comfort can as easily be found in a fresh fruit smoothie or clear spiced broth as a rib-sticking stew. What matters most – he explains – is understanding how a dish can satisfy your needs; finding a balance of ingredients in order to delight not just the stomach but the senses too. While I absolutely agree with everything Hugh says – at times the cleanest flavours can be both indulgent and satisfying in their simplicity – I would add an extra element to the equation; the comfort that comes with the preparation of food, as well as with its consumption. For someone who loves cooking, there’s nothing more satisfying than rolling up your sleeves and getting into the kitchen. And there’s nothing more comforting than the steps and motions required to prepare a dish you love. Making bread is one of my favourite forms of therapy, weighing and sifting, mixing and folding, kneading, shaping and dusting the dough. Custard is another. I love whisking the eggs and sugar into a light, glossy batter, warming the liquid, combining the two then slowly stirring over a flickering flame until the magic occurs and the mixture starts to thicken. Of course the end result when spooned over pies, poured into tarts or frozen as a rich, velvety ice cream is always an incentive, but the process in itself can often be more than enough to bring a smile to my face. At the other end of the scale there are the recipes that take you out of your comfort zone, those that require a little more concentration, a hotter pan, a firmer hand or a deeper understanding of technique. Pastry falls into this category for me. While I’ve never had a complete disaster – except for a certain exasperating incident involving an extremely short chocolate pastry which I’m going to choose to ignore – I tend to have at least one wobble at some point during the process; have I over mixed the ingredients, is the dough too thick or thin, will it crumble and crack or burn as it bakes? As delicious as the end result may be, the process – for me – is not something I would call relaxing or comforting. The recipe below is an attempt to achieve comfort both in baking and in eating, addressing my fear of pastry and embracing my love of custard. It’s light enough to escape Hugh’s category of stodge, but still incredibly indulgent and packed with wintry flavours. The custard is made using dark, sweet rum, crunchy pecans and a rich, nutty beurre noisette, before being poured over syrup-soaked pears. And the tart shell is a revelation – a resilient (but baking to a light and flaky crust) dough that is made (using a stand mixer) in seconds before being pressed straight into the tin with no need for either rolling out or baking blind. Combined, the crisp shell and luxurious filling are sheer bliss, made all the more memorable by the addition of chocolate in ice cream form, the perfect accompaniment for pears. A couple of weeks ago I mentioned a Jamie Oliver recipe I’d made, an apple, pecan and maple treacle tart. While this pear tart shares similar flavours – soft, sweet fruit, crunchy nuts and sticky syrup notes, it’s an altogether more elegant affair; heavier on the fruit but lighter on the palate, more fitting to be served in a French pâtisserie than as a British pud. And the chocolate ice cream is out of this world. Made with a mixture of 70% dark chocolate and pure unsweetened cacao, it’s incredibly dark and decadent with a chewy, almost mousse-like texture. Because the tart contains custard, I made the ice cream with a mixture of double cream and milk to avoid an egg overload, but it’s still silky smooth and beautifully glossy. The recipes running in The Guardian over the next couple of weeks should be a wonderful way to survive the winter blues, providing comfort without resorting to classics, and introducing our palates to a gorgeous array of spices, herbs, flavours and textures. My suggestion? Make those recipes for your main course, then try this for dessert. The incredible aroma of rum and browning butter will stimulate your senses, the gently thickening custard make you calm, the oh-so-simple pastry bring a smile to your face and the first incredible mouthful warm your heart. Beat the butter and sugar at a low speed in a stand mixer with the paddle attachment until just smooth, about one minute. Add the egg yolk and mix for 30 seconds, then add the flour and salt, mixing until the dough just comes together. Place in the middle of a 23cm tart tin with a removable bottom and use the heel of your hand to press the dough right out to the edges and up the sides. Try to keep the surfaces as smooth as possible. Once the dough is evenly distributed, pop the tart shell in the freezer for one hour. When ready to bake, preheat the oven to 190 degrees C. Get your tart shell out the freezer and prick the base all over. Bake for 7 minutes (no need to line with beads) then give it a check. If the pastry is starting to puff up, push it back gently with a metal spatula, then continue baking for a further 15 to 20 minutes until crisp and golden. Remove from the oven and leave to cool. Put all the ingredients except the butter and pecans in a bowl and whisk until combined. In a large frying pan, warm the butter over a low heat. Let it bubble up, sizzle, then settle down – it should be a beautiful golden colour and smell toasty without being burnt. This is your beurre noisette. Pour the beurre noisette into your egg mixture, whisking quickly to combine. If there is any sediment at the bottom of the frying pan, try to avoid getting it in the mixture. Pop the bowl in the fridge for around an hour to firm up. Toss the pears in a bowl with the sugar and rum. Leave to macerate for fifteen minutes or so. Lay the pears in your tart shell in concentric circles. Pour the custard over the pears, filling right up to the edges but being careful not to overfill. Don’t worry if you can’t see the pears any more – they will emerge as your tart bakes! Bake the tart on a baking tray for about 30 minutes, or until beautifully browned. Remove from the oven and leave to cool completely. Whisk together the cream, cocoa powder, sugar and salt in a large saucepan. Heat the mixture, whisking frequently, until it comes to a rolling boil and starts to foam up. Remove from the heat and whisk in both chocolates until completely melted, then whisk in the milk and vanilla. Blend the mixture in a food processor for 30 seconds until smooth, then chill thoroughly in the fridge before churning and freezing. About 10 minutes before you want to eat, remove the ice cream from the freezer to soften. 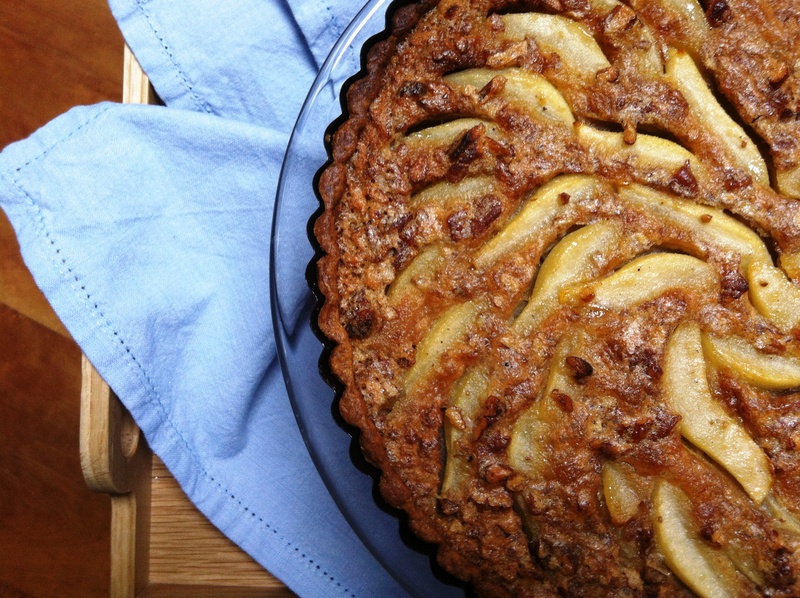 Set your tart on an upturned tin – this should help to remove the sides. Slide the base carefully off with a knife and put on a serving plate. 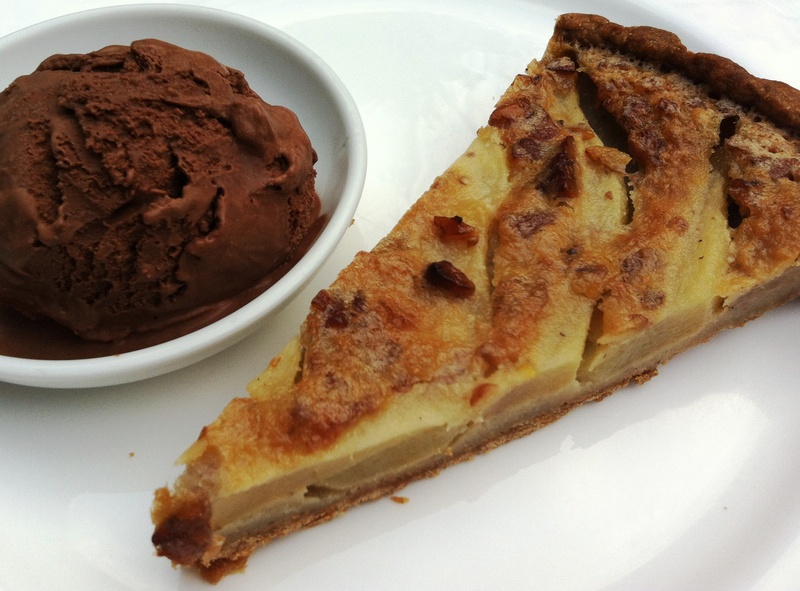 Cut the tart into thin slices and serve with a scoop of velvety dark chocolate ice cream or a smidgen of crème fraiche. We ate it on Saturday night with my parents and the last slice was gone by Monday morning, a naughty (but very comforting) breakfast to start the working week. Lovely post, really enjoyed it and the tart looks fabulous! Amazing looking tart,that first photo is fantastic. I will have to steal this one. 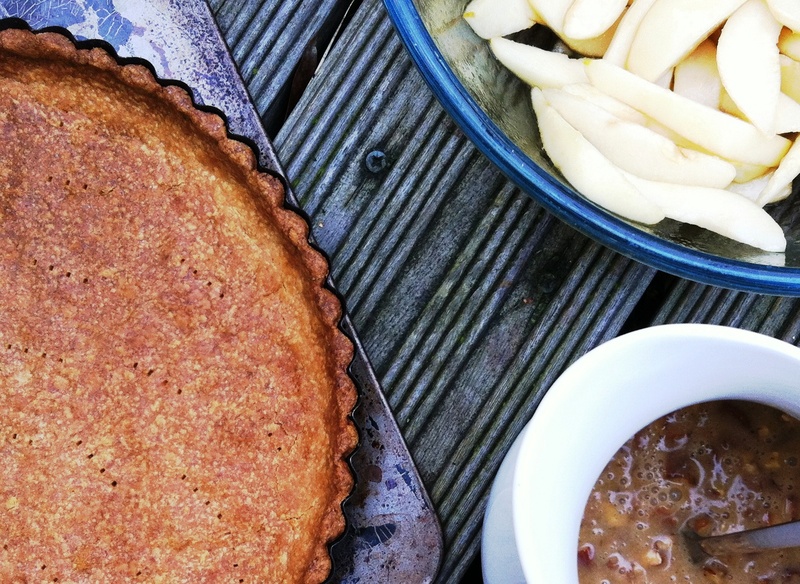 This tart looks just wonderful, I love the combination of flavours and that pastry does sound pretty foolproof – I will have to give it a go next time I make a tart! The combo with the chocolate icecream is a fab idea! Even after a meal and dessert, that tart makes me hungry. But I too share your fear of pastry. It’s closely tied into my fear of bread-making. It just seems that too much could go wrong. That sounds amazing, fabulous combination! Swoon. Comfort food to me is anything that can be eaten with one piece of cutlery. This wins. Argone – haha yep Hugh has cut his hair and lost quite a bit of weight! I love his recipes but think they are getting even better as the years go on. And yes, please do email me about the nocciola – contact details on my ‘About’ page. Amee – your comment made me giggle…each to their own! Kathryn – definitely try this pastry – it’s my new favourite kitchen cheat! 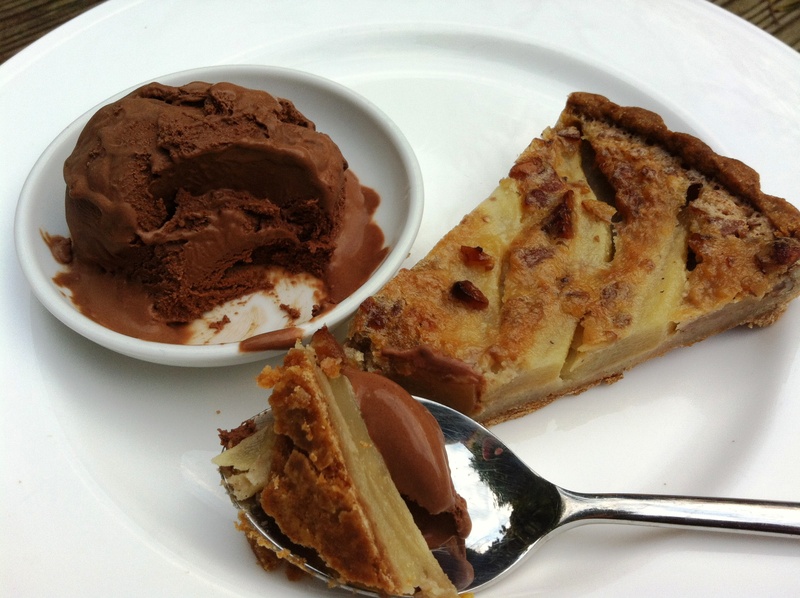 Regula – I couldn’t make a dessert and not do an ice cream to go with it, and pear and chocolate is such a classic. Tori – I also ate a slice straight from the fridge for breakfast on Monday morning. If you discount the knife needed to cut it that’s completely hands free comfort food eating! I am envious reading this. I still haven’t quite got the hang of yeast (although Short & Sweet is helping) and if I ever write a memoir, it will be called ‘Custard is my Nemesis’. But I am so giving this go. I’ve just dug the tart tin and out specially. It sounds heavenly! 1. That tart looks amazing. So does the ice cream. This tart looks wonderful and I imagine the dark chocolate ice cream compliments it perfectly. I’m not that confident with pastry so I’ll definitely try this recipe next time I make a tart. Yummy! This tart looks great 🙂 I’ve only recently started liking pecans but i’ve always liked the taste of brown butter 🙂 Thanks for sharing! Beautiful tart. I am an advocate of comfort food throughout winter through and through as well–umm I cannot last through this slushy rain and cold without a brownie or slice of tart, and I’m pretty sure no one else can either! By the way, I love all this Ready for Dessert recipes you’re showcasing. (Have I said this before? Oh well.) I love that book. Comfort baking. And comfort eating. Looks like an absolute must. Miss South – let me know how you get on! 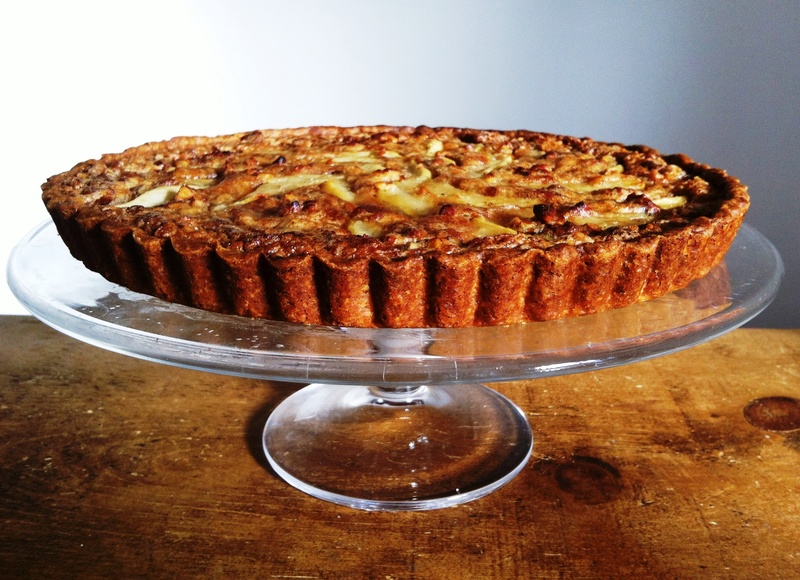 I’ll let you in on a little secret – I could only find my 27cm tart tin, so eked the pastry out to fit it and added an extra pear. It worked absolutely fine, proving how incredibly adaptable and amazing this pastry is! A Spoonful of Yumm – the chocolate ice cream would be delicious on its own too. Laura – do try the ice cream, it’s so good – really thick and slightly chewy – kind of like frozen chocolate mousse. Laura – let me know how you get on! Daisy – brown butter is divine. Glad you’re getting into pecans too – they are so good in desserts. Lorraine – 100% agree – so much comfort food is about nostalgia and recovering a sense of a certain time or place. Skye – what’s chocolate ear pudding? I intrigued! What an absolutely STUNNING pudding. Totally my idea of comfort and I love all of the secret ways to pack in flavour. Very clever. just discovered your blog — love your recipes! I read Hugh’s article about comfort too, and I agree, comfort doesn’t always have to be carb laden. I find the most comforting foods for me are foods that are linked with memories. Love your tart. The combination of pears, pecans and brown butter is a winning one in my books. Brown butter and chocolate….say no more, that is a heavenly match. I was just going to look up recipes with pecans on your blog and I find this waiting for me…wow! What a combination. Perfect. Modern Working Girl – so glad you like it and hope you’ll be back for more! Jennifer – 100& agree on the memories front. Sylvie – with those ingredients it’s hard to go wrong! Looks delicious and that top photo is beautiful! I’ve seen a few recipes with pure cacao in but I’ve never used it. I’m not even sure I know where to get it, where do you usually get it from? Another winner from you, this sounds wonderful. I’ve been meaning to do something with brown butter for ages as it has such a lovely flavour. I got Hugh’s recipe cards and noted the peanut butter flapjacks which I’m looking forward to trying – not as much as I want to try your peanut butter ice-cream though. Julia – thank you. I used Willie’s Cacao which I got in Waitrose, but you can also order it online. Click on the link in the recipe above and it’ll take you to Willie’s website. Choclette – brown butter is wonderful, definitely do make something with it soon. I absolutely love baking with brown butter! Your tart looks delicious!